We are coming into the season of root vegetables. Not of fresh basil, or other herbs out of which we can make delicious pestos. But this recipe is a pesto recipe nonetheless. One we can enjoy all winter long, even from a local vegetable source. The inspiration for this pesto came from Irini, a private chef on the Greek island of Mykonos. A GREAT cook. She whipped up some basil pesto, and told me that when she doesn’t have basil, she makes a pesto with feta, or even with tomato. I had beets on hand, and wanted a new use for them. 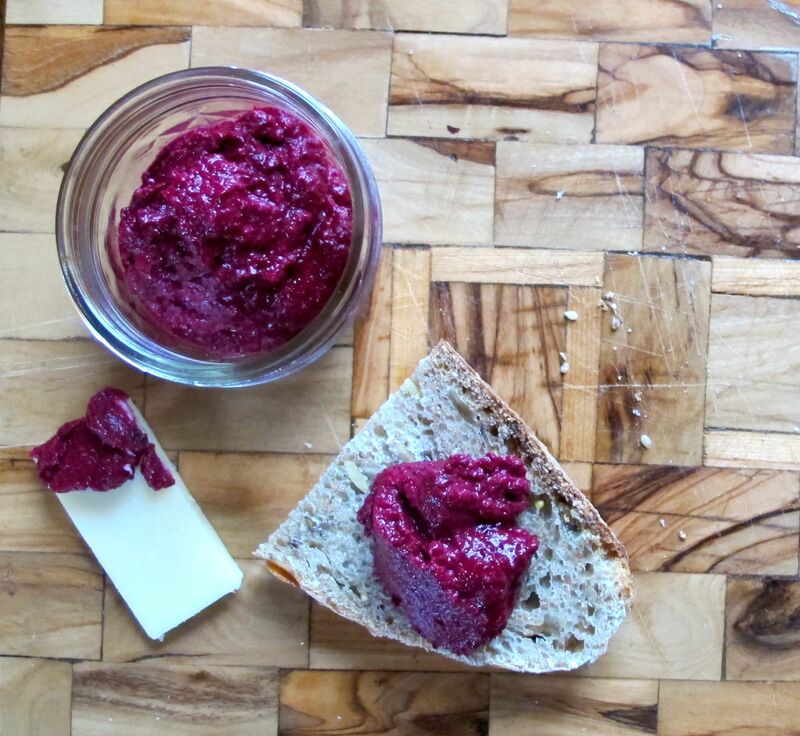 The result, beet pesto. It is SO simple. All you are doing is roasting bigs, toasting pine nuts, and blending them together with some raw garlic and EVOO. See below for precise instructions. Preheat your oven to 375 degrees. Rinse your beets (but do not peel). Dust the bottom of a baking dish, ideally one that snuggly fits the amount of beets you are cooking, with salt. It should look like the snow accumulation after one hour, not one entire day. Place beets on top, drizzle with olive oil, and add enough water so it is about a half inch deep. Cover the dish tightly with tinfoil. Roast until fork tender* or softer, one hour and and half. The timing depends on the size of the beets. Small beets take a little less time, large beets that you sometimes see at farmers’ markets can take longer. Good news is, this will be pureed, so it’s fine to overcook a bit. Let the beets cool slightly, and then peel with a peeler or just with a towel that you don’t mind looking really fuchsia by the end of your work. In the meantime, heat up your pine nuts in a skillet over medium heat. Watch closely so they don’t burn, and agitate them each minute. When they start to get oily and aromatic they are done. This should take about five minutes. Put the beets, nuts, garlic, and olive oil in a blender or food processor and blend until smooth, or slightly chunky, your choice. Start with 3 tablespoons of olive oil and add more if you desire or if the machine won’t spin. Add salt and pepper to taste. *fork tender means that when you stick a fork in the beet, it slides right in without resistance.